Some people say it’s overrated. Some people say it’s underrated. I say (and I’m not the first to) that reading is the gateway to a life’s worth of learning. Whether it’s because it helps you develop an interest in things or keeps you up-to-date in your industry, finding the right sources to read frequently can make your life way easier (and more interesting too). I might be a bit biased in this scenario. After all, my mom does work in a library. For the record though, I barely ever go to those, whether it’s hers, my school’s or any other. However, I have no problem sitting down and reading. While many other people prefer fiction, I like reading something that’s educational or practical in my life. Here’s what I read and why, plus how I picked each one up in the first place. The first experience that really got me reading in my adult life was a source of content itself. While I interned with CAREEREALISM, I read all of its free content, signed up for seminars, and digested anything that came my way in order to help promote it through Twitter. I visit the site almost as frequently now as I did when I worked there, because I legitimately enjoy, learn from and believe in the blog posts, videos and other advice it offers. If you’re looking for a good career blog to observe, no matter what stage of your career you’re in, check it out. The next source I started to read religiously had nothing to do with any of my interests, but it turned out to be a great tool to expand my value as an employee and even overall nice guy. It all started with a book. While I was working for the Hudson Valley Renegades, I did a bit of sales work, plugging tickets and advertising. I had no other significant sales experience before my time in New York, so I figured I’d better learn from experience, from others I was close to and from experts while I was at it. I read the Little Red Book of Selling by Jeffrey Gitomer, then got hooked on his free sales tips newsletter. I know a lot more about selling and a TON more about customer service thanks to Jeffrey and his staff, plus the testimonials and experiences of his customers. I’ve found that much of the advice from Jeffrey is actually applicable to other parts of life. Read some of it yourself (or one of his million books) to see if you agree. Being involved with social media means using the internet for the best advice. I’ve found Mashable and Tech Crunch to be the best social media and technology blogs out there. If you’re reading this blog or interacting with me through social media, chances are you’ve at least heard of them. Mashable is great at describing the most important details without any confusing jargon, while Tech Crunch has details galore on most of its topics. What a surprise. Reading leads to more reading. I learned that firsthand when I discovered Napoleon Hill through the Gitomer emails. I never have and never will meet Napoleon Hill (mostly because he’s been dead for 30 years or something), but his advice has been great. His timeless words are great for interacting with people and especially for solidifying your self-confidence. Some of it seemed like common sense to me. Then I realized it’s because I knew it already, and that helped me feel even better off. Napoleon (like his counterpart, Bonaparte) conquered something: the internet (/his employees created a free advice newsletter). I learned about Lifehacker, another great site, during my time at Hill Holliday. Whether you’re trying to get more out of your day with a couple of simple adjustments or you want to completely rewire your refrigerator, Lifehacker has some solid (and often unique) advice for you (thankfully with varying levels of complexity). In addition to all this stuff, I love reading magazines like Sports Illustrated, Fortune, and Kiplinger’s Personal Finance, plus books about sports, sports broadcasting and anything that has a life lesson. What do you like to read most? 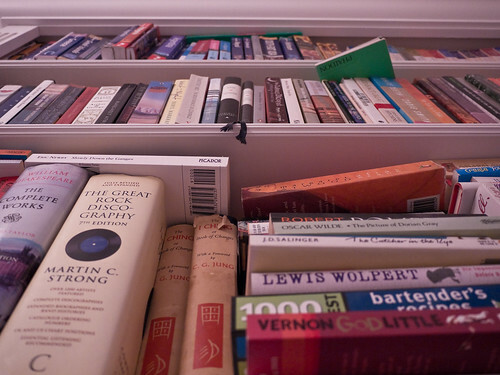 Do you have any stories about how you found valuable books or resources that you enjoy? Did I happen to list any of them? Will this game of Twenty Questions end at four? (Answer = Yes.) Share it all here with a comment!